Marlene Miller has added another book to the giveaway contest of her memoir Grace Leads Me Home. We’ll give away 2 books tomorrow. If you would like to enter the contest you can do so here. I was asked about those little images which appear by commenters names. They’re called “gravatars”, and they appear on any gravatar-enabled websites when you leave a comment. You can upload one for free here. If you don’t have a gravatar, either a blue G or grey silhouette will appear by your name. When I do my next blog template update they should all go to silhouettes. Do Amish do anything special on July 4th? Here is a post about Amish and Independence Day from a few years back. Amish in Topeka, Indiana also run a (human-powered) buggy race on the Fourth (or at least they have done for many years, haven’t heard about this year). You can view a short clip of one such race here. Thanks for all the advice on my summer colds post. I am heading to the doctor today. I should live, but my cough has worsened, and like a lot of you said, 2 weeks is a little long. 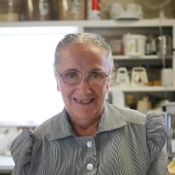 I’ve been alerted by a few people that Amanda Yoder of Yoder’s Restaurant in Pinecraft has passed away. Her restaurant was featured on the “Man vs. Food” program a while back. I’ve never visited Yoder’s but I understand it to be a hub of the Pinecraft community. Today’s photo comes from Bob the Quaker, taken in Lancaster County around the same time he shot the “Top Riders” image. Just where does the nozzle go? Actually, you can see where the nozzle goes here. I would like to read this book. Please enter me in the drawing. Would love to win the book. Would be interesting to read I’m sure. comment on odds and ends on the fourth. I would love to win the book. I love reading about the Amish and their way of life. Yes, I , too am wishing for a win ofthe book though I will read it – win or not… and, Like Richard, I am sorry for the loss friends and family have that comes wtih Amanda yoder’s passing. Loss can be a bumpy ride. How nice to hear of the way she touched many. Another ditto of Richard’s comments with a wish for all to have a happy Independence Day. May we retain the freedom we enjoy here in these United States of america! I really enjoy learning about the Amish and have visited some Amish places around the United States. I love talking to them at markets and I love reading their books. I would love to read this one. If you would like to enter the book contest, just click the link I provided above and leave your comment there…that will make it easier on me if all the entries are in one place. Thanks! I would love to win the book. Happy 4th and be safe..
yes I am working, some are taking the day off. Just like you said. Im afraid of adding new things to my computer due to bugs and spyware. I hope you will enter me for both books Erik. Im sorry to hear about Amanda Yoder’s passing. I have friends in Florida that frequent her restaurant and have told me how good the food is. Hopefully one day I will get to Pinecraft and sample the food. It will be sad not to meet Amanda though. Im sure she has reached many in her life. Mix equal parts of lemon and honey and bring to a small boil. Cool enough to be able to use. Take 2 Tablespoons of this several times a day and it will help with your cough Erik. What is he taking the gas to use in? Lawn mover maybe? I love my Amish books and would love to have more. I’ve never won one but maybe this time. BTW….on our car trip to Arkansas this spring we say one Amish buggy crossing a railroad track. I think it was somewhere in Tenn. I wasn’t driving…I was too busy talking to my sis in law in the back seat with me. :) I’d love to go through Amish country someday. In Christ’s love, M.A. This sounds like a unique story. I have read several on folks leaving the Amish, but none about an English person who converted, and STAYED! 40 years is impressive! Co. Indiana and at the Daviess Co. Indiana Produce Auction. the cornfields and soybean fields look to be in distress. I don’t want to enter the book contest, thanks though. I do want to wish my Yankee friends a happy Fourth, the First was lovely around here. Cars, Amish buggies, both have ample “horsepower”. As I sit in my family room, listening to a few foolish people setting off fireworks (we’re in a drought, and most public fireworks displays have been cancelled due to fear of fires started by fireworks),I want to wish everyone a happy “what’s left of the 4th”. Happy to have the freedom to choose my religion and speak my mind :)…how ’bout you? Happy 4th of July everyone! I just got down to Lancaster for a week. The streets seem quiet but I did see a few large Amish gatherings at homes and one tented event (maybe an auction or a benefit of some kind.) It was held across the street from the Bird-in-Hand Farmer’s Market. I am amazed how they can work out in the fields with this heat. They are expecting 100 degrees on Saturday. Ugh. Hope you feel better Erik. Maybe a piece Shoo Fly pie would be just what the doctor ordered. This book sounds so interesting. Please enter me in the drawing. Thanks. It is very dry here yet in our neighborhood there were plenty of fireworks plus by walking down a couple of houses I could see the big ones going off in a city north of us. At about 11pm there was a lot of smoke in the air just from the fireworks, but today it rained. I hope it helped the fires that were burning south of us by 100 miles or so. 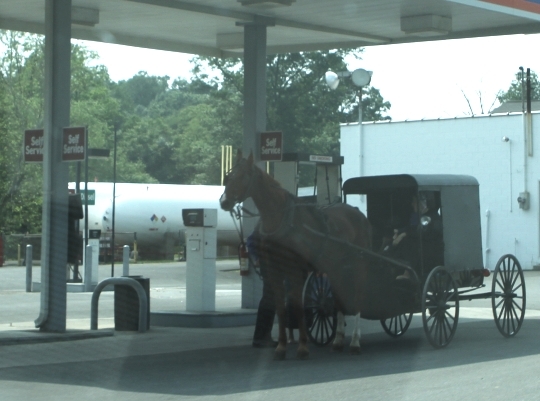 God’s Blessings…..btw…in my previous post I meant to say that I saw only one Amish buggy on our trip. Have been to this restaurant many times and always found Amanda’s presence to be “larger than life” in the business and community. A “sad day” for sure, but the memories will remain.